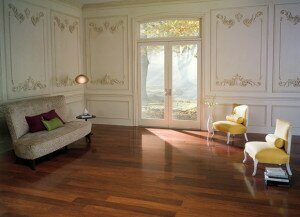 Our team of experts can provide hardwood flooring installation for your residential property in Lakeland, FL. Hardwood flooring is a classic option that continues to stay stylish throughout homes across the country and right here in Lakeland, Florida. One key reason to choose hardwood flooring is how durable it is; if you take care of the wood, you won’t ever have to replace the flooring. In fact, older homes increase in value with original wood flooring. You can use a few sheets of sandpaper, some glossy finish, and a little bit of elbow grease to restore hardwood flooring to its natural sheen. Another key benefit of hardwood flooring is the reduction in allergy symptoms that many people report after installing this material in their homes. Carpets can harbor dander and dust within each fiber, so these allergens float through the home and stay nearby, causing allergy-sufferers to continue to react. If wood floors seem too cold or hard for your liking, you can place rugs or carpet runners throughout the home to warm up the space. Hardwood flooring is more expensive than other options, but you won’t have to do a lot of maintenance to keep it looking new. Run a vacuum over the floor, and use wood cleaner to spot treat if needed, and that’s it! At Jim’s Floor Depot, our team of experts can provide hardwood flooring installation for your residential property in Lakeland, Florida. If you love the look of a certain wood type, but would prefer it in a different color, we can also stain and finish hardwood flooring to match with whatever you like for your home.